We've seen plenty of curved screens from HDTVs to monitors, but Samsung will be the first curved all-in-one. 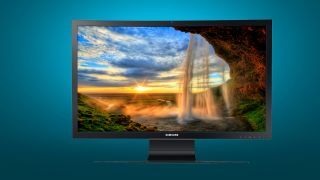 The Samsung ATIV One 7 Curved is a 27-inch all-in-one that features a 1920 x 1080 resolution screen that wraps around the user. As with other curved screens bends slightly to fully envelop the user's field of view for a more immersive viewing experience. Unfortunately we weren't completely sold on ATIV One 7 Curved from our short hands on time with it. The curved screen is a neat feature, but it did not enhance our viewing experience in the same way as a large format TV. Aside from the curved display, this all-in-one also comes with some booming 10-watt HD audio, Dolby Surround speakers, which may draw the ire or envy of your neighbors. Another neat feature of the ATIV One 7 is it pairs up with any Samsung smartphone for one-tap music playback. This allows users to transmit any tunes playing on your mobile device to the desktop's mega speakers. This machine also features an Intel Core i5 processor, 8GB of RAM and a 1TB hard drive. The Samsung ATIV One 7 Curved will be available starting this Sunday, March 8 for $1,299 (£1,129, AU$1,449). We'll be reviewing this unit shortly, so stay tuned to this space.